China’s Yangtze river, the third longest in the world, turned red on Thursday afternoon, state television reported. State broadcaster CCTV said that the environmental protection bureau in Chongqing had ruled out the possibilities of industrial and sewage pollution causing the river to turn red. “It’s not a problem,” one boatman said in Chongqing. “The water [color] is within the normal range. For us boatmen, [the color] just means the river is washing its water. “[But] the color this year is redder and darker,” he added. Investigations are still underway but authorities said silt deposits brought in by floods from upstream were a likely cause for the color. The world is comin 2 an end!! 3 Then the second angel poured out his bowl on the sea. The water became like the blood of a dead person, and every living creature in the sea died. 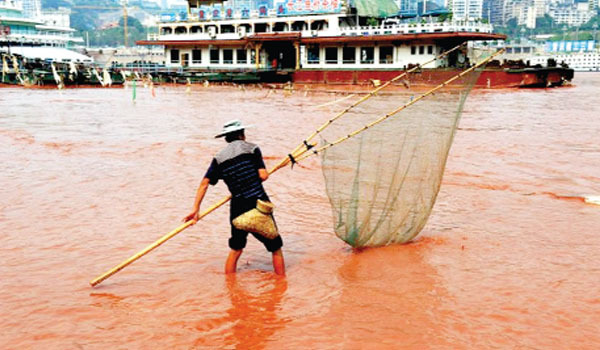 Largest River in China turning red. Judgements of the End Times. Read Revalations 8 aswell.